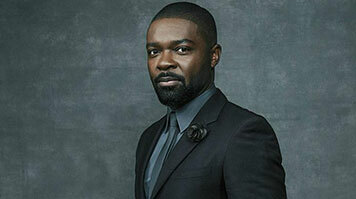 David Oyelowo OBE is one of this year’s Honorary Doctors in LSBU’s School of the Arts and Creative Industries. David is a renowned actor and film producer, an active promoter of diversity in Hollywood and, through films such The Help (2011), The Butler (2013), Selma (2014) and A United Kingdom (2016), chronicler of black experience. As well as living in London and now California, I spent part of my childhood (from age 6 to 13) in Nigeria. Spending formative years in a country where I was not in the minority played a huge part in forming my sense of identity, my sense of self and my confidence. As a result of living for years in a society where every opportunity on offer was available to me, I don’t have a minority mentality. When I came back to London I still believed that everything was open to me, regardless of what was actually going on in society. That became my approach to life. Gill Foster, who now teaches at LSBU, had a huge impact on me. She was my Theatre Studies teacher at sixth form and I really valued her opinion. When she suggested I should go to drama school I began to consider acting as a career for the very first time. She helped me with my application and encouraged me to go to join the National Youth Music Theatre, which is where my ambition to become an actor solidified. I was the only black student at LAMDA for the first year I was there (and was only able to be there because I’d won a scholarship). With so few people from BAME groups coming through drama school, young people of colour didn’t see their lives reflected in films or on TV. That kind of invisibility affects you. I knew quite early on that I had to play a part in changing things – I had the gumption to do that because I hadn’t been made to feel marginalised myself. When I left LAMDA and got an agent I requested that they send me to read for any decent part, not just those that specified a black actor. I believe that the best weapon against prejudice is excellence. There was a fair amount of controversy when I was cast as Henry VI by the RSC, but when you start breaking it down the story resonates across centuries and it always reflects something about society – after all, in Shakespeare’s time women weren’t allowed to perform, and no one suggests that they should be left off the stage now. If you give a good performance, eventually your detractors will be silenced. Acting is subjective; you can’t please everyone, but there can be a consensus on good work and thankfully that was the case with Henry VI. Moving to Hollywood was much tougher than I’d expected. I wanted to produce, write and direct as well as acting and felt I’d have to plant myself in different soil to do that. I made the move with my family in 2007, then in 2008 came the economic crash and a writers’ strike in Hollywood, so there was a 14-month’ stretch when I didn’t work, with two kids and another one on the way. In 2010 I got cast as Martin Luther King in Selma. The film took four years to make, but the mere fact of being cast changed people’s perception of me and opportunities began to come my way. I’m interested in writing and producing because there are a lot of stories I feel are not being told. You can sit around and complain about the opportunities not being afforded to people of colour, the aspirational stories that aren’t being told, or you can do something about creating them. Everything I produce is an example of what I want to see out in the world, what I would have loved to have seen growing up. A United Kingdom, for example, tells the true story of an African king who cared for his people, who was educated and compassionate. I’m most proud of that film and of Selma because they depict male blackness in a way that is admirable and aspirational. You rarely see that. Racism, prejudice and marginalisation are as present now as they have ever been. Brexit in the UK and Trump in the States are bringing out into the open some of this stuff that’s been bubbling under. But I’ve also noticed that there’s a much greater effort being made now by people who genuinely believe in equality, not just racial but gender too. I have seen an upswing in that, which can only be a good thing. Oprah Winfrey has inspired me to stick to my convictions, work hard and be more outward looking. I played her son in the film The Butler and she is the easily the most impressive individual I’ve ever met. She is has an amazing ability to listen and is great at giving advice. She’s a titan of a human being! We all need a little luck (it took Gill Foster for me), but ultimately the difference between good and great is hard work. There’s no substitute for that. I also believe – and this is something I’ve learned from living in America – that there’s a fine line between humility or self-deprecation and self-sabotage. I’d say we need to start putting false humility aside: grasp hold of your life and run with it. That’s the approach I’d advocate for anyone graduating now.